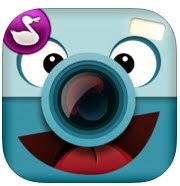 ChatterPix Kids, by Duck Duck Moose, is in a class by itself. Take photos of your favorite stuffed animals, toys, friends, pets, or any object. Add a line for a mouth and record your message. Perfect for auditory bombardment - take pictures of 10 or more toys and record appropriate words. Have pictures set up and ready to record. Let students in centers practice target phonemes while independently recording.